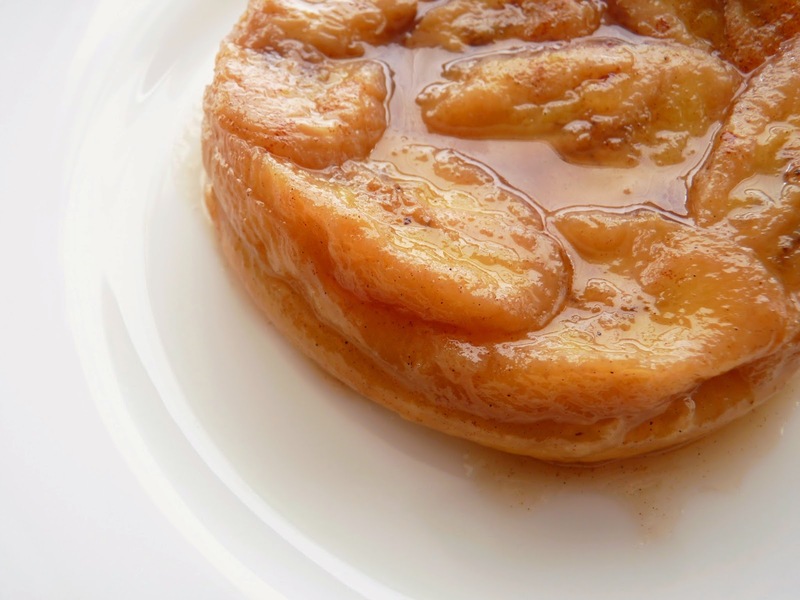 Tarte Tatin is an incredible French dessert that traditionally consists of apples simmered in caramel on top of the stove and then baked with a circle of puff pastry dough nestled on top. It’s then flipped over and plated to reveal a showstopping display of tender fruit bathed in a rich caramel on a bed of buttery pastry. It’s phenomenal. 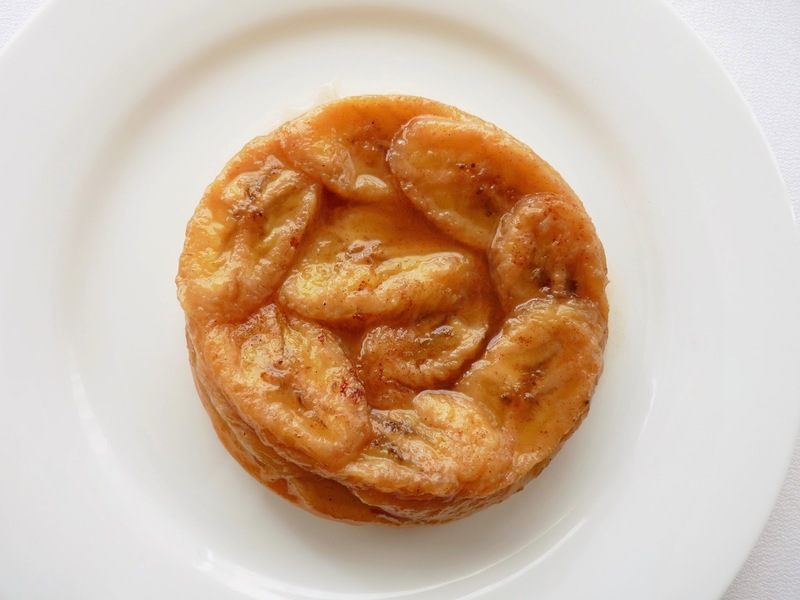 This is a much simpler recipe from Bon Appetit that uses the same idea to showcase bananas. It's prepared as individual servings and instead of making a caramel for the bottom, you simply butter the ramekins and line the bottoms with some brown sugar. 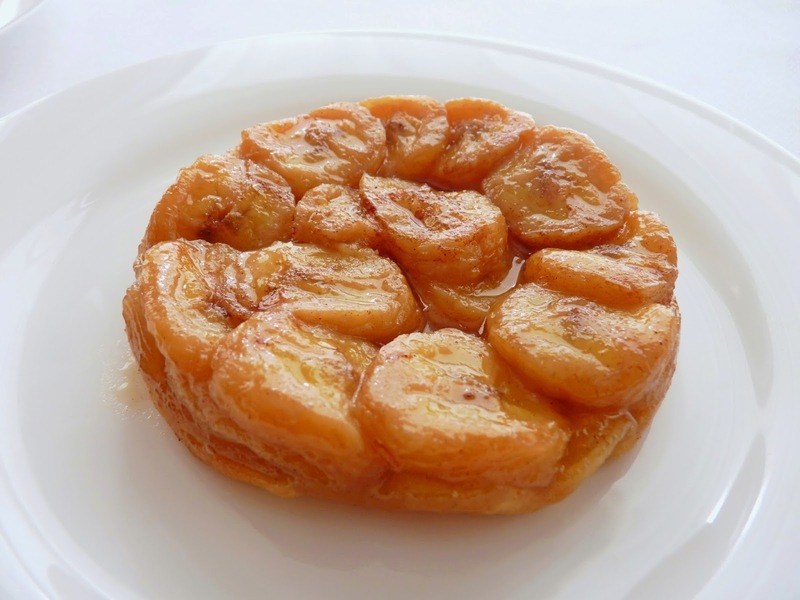 Then you arrange slices of banana and top with a circle of purchased puff pastry. It’s probably one of the easiest to prepare desserts imaginable. You can certainly use store-bought puff pastry if you have a brand you like. I made a simple butter pastry called Rough Puff. It’s a very streamlined version of puff pastry that isn’t difficult or complicated, it just takes a bit of time for folding and chilling if have the luxury of planning ahead. This is a super simple preparation fashioned out of basic ingredients that turns our to be a very satisfying dessert. If you want to dial it up, you can easily enhance your servings with a dollop of whipped cream or a scoop of vanilla ice cream. Quite a good way to enjoy bananas with pleasure. - I added a pinch cinnamon mixed in with the brown sugar. - Any size ramekin works as long as they are at least 1 1/2” deep. If you don’t have ramekins, you can use an 8” square baking dish, placing a whole sheet of puff pastry in tact on top. - The Rough Puff dough comes together very quickly in a food processor. It will not look like a dough but rather like a slightly moist cottage cheese. The important thing is to keep visible pieces of butter in tact and avoid blending it all into the flour. When shaping and folding the dough, do your best to keep the edges straight and aligned. Lightly dust with flour as you go and then brush off any excess flour before folding. Preheat oven to 400 degrees F. Place four 4” x 1 3/4” ramekin dishes on a rimmed baking sheet. Butter liberally with 1 tablespoon of butter for each dish. Evenly distribute 2 tablespoons brown sugar on the bottom of each ramekin. Peel the bananas and cut on a diagonal into 1/4" slices. Overlap slices of 1 banana per dish over the sugar, arranging in concentric circles to cover the bottom. Cut rounds of puff pastry 4 1/2” in diameter. Top each dish with 1 puff pastry round, tucking in the edges to fit. Bake until the pastry is golden and puffed and the filling is bubbly, about 20 - 25 minutes. Remove from oven and carefully invert onto serving plates. If you’d like to make your own dough, place the flour and salt in the bowl of a food processor and combine. Cut the cold butter into 1/2” cubes and add. Pulse just until the butter is the size of small peas. Add the cold water and pulse just until the mixture resembles something like a slightly moist cottage cheese. Gather the dough and place on a piece of plastic wrap. Form a disc, seal it tightly and chill for 1/2 hour. Lightly flour a work surface. Roll the dough out to about an 8” x 4” rectangle, lightly flouring as needed. Fold the shorter sides of the dough in equal thirds like a letter, keeping the edges as evenly lined up as possible. With the open edges perpendicular to you and seam side down, roll it again into an 8” x 4” rectangle, lightly dusting with flour as needed and then using a pastry brush to remove any excess flour before folding. Turn it and fold the shorter sides of the dough again into thirds. Repeat this process one more time for a total of three times. If at any point the dough starts becoming too soft or elastic, let it rest in the refrigerator for a while before continuing. Lastly, roll the dough out into a rectangle about 1/4” thick. Take both shorter sides and fold toward the center like a book, keeping the edges as straight as possible. Then fold one side over the other so there are 4 equal layers on top of one another. Wrap the dough and rest in the refrigerator for 1/2 hour. Roll the dough out on a lightly floured surface until it is about 1/8” thick. Brush off any excess flour. Cut out circles 4 1/2” in diameter and place on a baking sheet. Chill until ready to use. 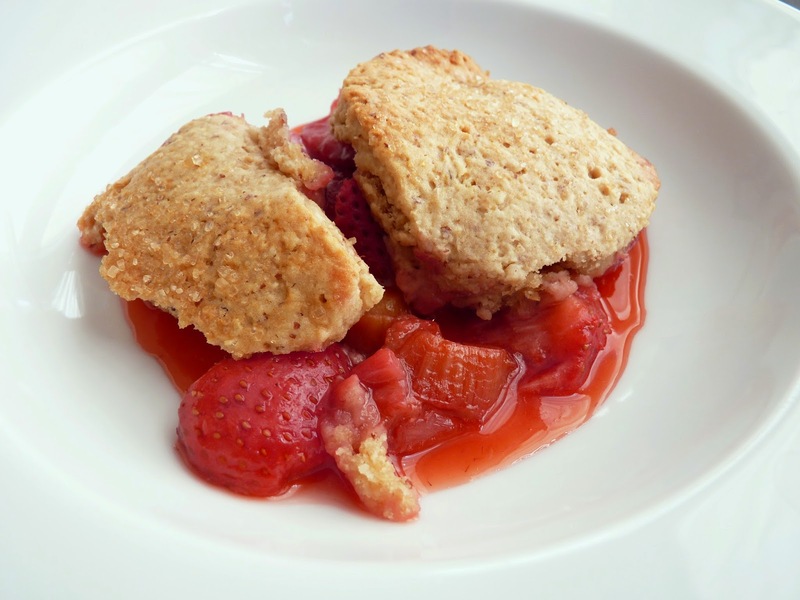 Spring and summer are all about rustic pastries and desserts made with fresh fruit. 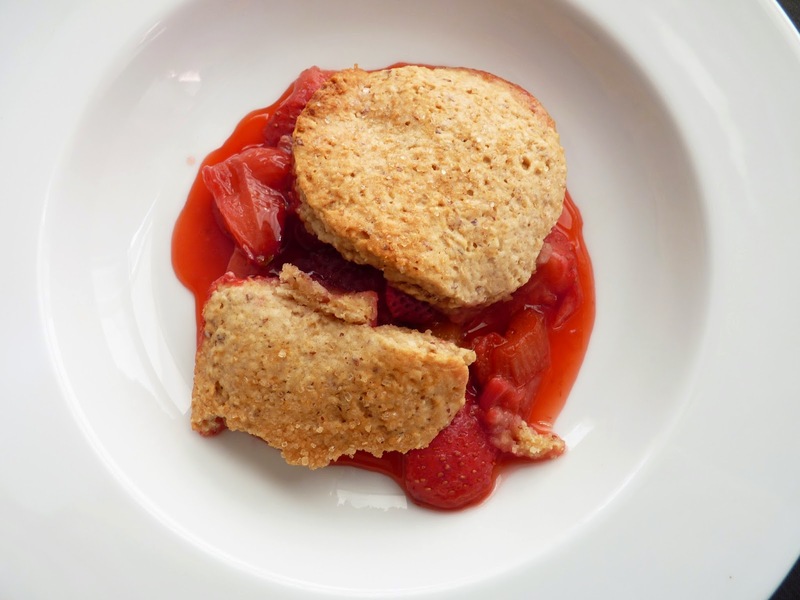 Pies, cobblers and crisps are without question something we crave as we head into this amazing seasonal parade of berries, cherries, apricots, peaches, nectarines, plums and figs. I’ve picked up some beautiful fresh strawberries and rhubarb and worked these into a pandowdy. This is an old-fashioned deep-dish spoon dessert that is topped with a thick layer of pie dough rather than a dumpling or biscuit used for cobbler. The fruit is thickened only slightly to produce lots of juices. The topping is traditionally broken up and pushed down into the fruit once it’s formed a crust during the baking process so it may have gotten its name from the crumpled appearance. 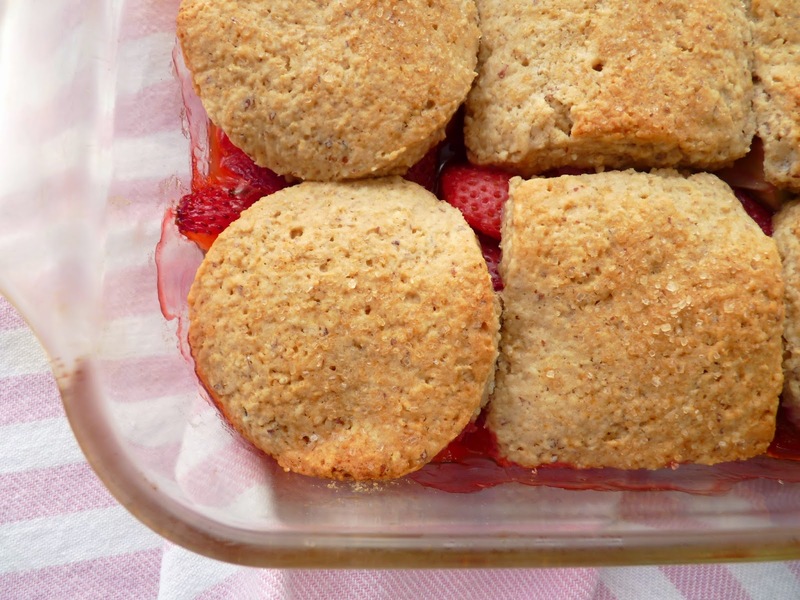 This pandowdy has a crumbly, nutty, topping and a combination of sweet and tart fruit. The topping is kind of a cross between pie dough and a biscuit. It has a perfect balance of flour and brown sugar combined with finely ground almonds and oats, which add a wonderful taste and texture. I didn’t carry out the traditional breaking up of the top crust because I didn’t want this tasty topping to lose its crisp texture and I wanted to keep the fruit juicy. The topping comes from a recipe for Raspberry Rhubarb Pandowdy from Williams-Sonoma. I used strawberries instead of raspberries and almonds instead of pecans. 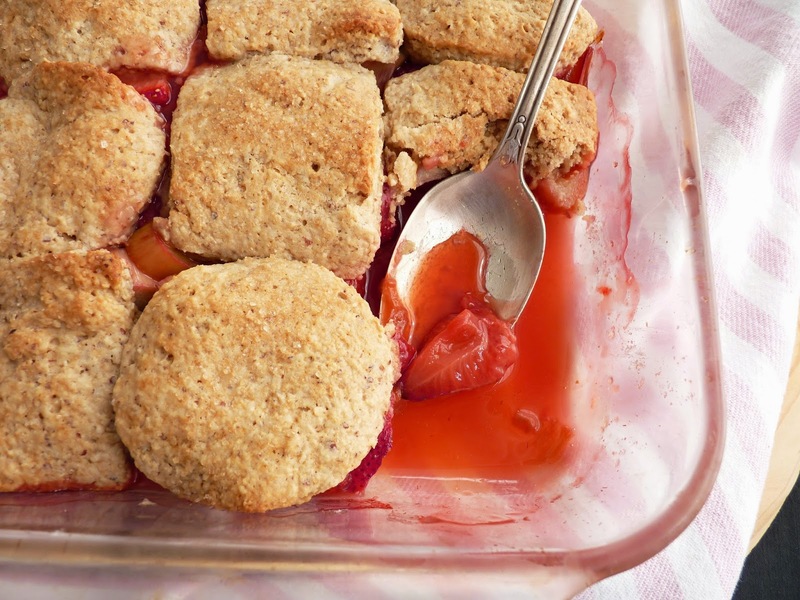 This is a really delicious alternative to cobbler. For an extra note of luxury, add a dollop of whipped cream or a scoop of vanilla ice cream. - I like to use sliced almonds because they are easier to process to a fine meal. - Toast sliced almonds in a single layer on a baking sheet in a 350 degree oven for about 5 - 8 minutes. Watch them closely as they will burn very, very quickly. - Taste your strawberries for sweetness and add sugar to your own taste. - Add the zest of 1/2 orange and/or 1/4 teaspoon vanilla extract to the fruit for a variation in flavor. - I cut out the dough with 2 1/4" square and 2 1/2" round cutters and got 14 biscuits. I used 9 to top the fruit. I baked the remaining 5 on a separate baking sheet for about 22 minutes. They’re delicious all on their own. For the topping, place the toasted almonds, oats, flour, brown sugar, baking power and salt in the bowl of a food processor. Process until the almonds and oats are finely ground. Add the cold butter pieces and pulse until the mixture forms coarse, uniform crumbs. Add the milk and pulse just until mixture comes together and forms a soft, sticky dough. Place on top of a piece of plastic wrap and pat into a flat disc. Cover with another piece of plastic wrap and roll the dough out to a 9” square about 1/3” thick. Slide onto a baking sheet and chill until firm. To make the filling, hull and halve the strawberries and place in a large bowl. Cut the rhubarb into 1/2” pieces and add to the bowl. Whisk together the granulated sugar and cornstarch and toss with the fruit to coat. Pour into an 8” square baking dish and distribute evenly. 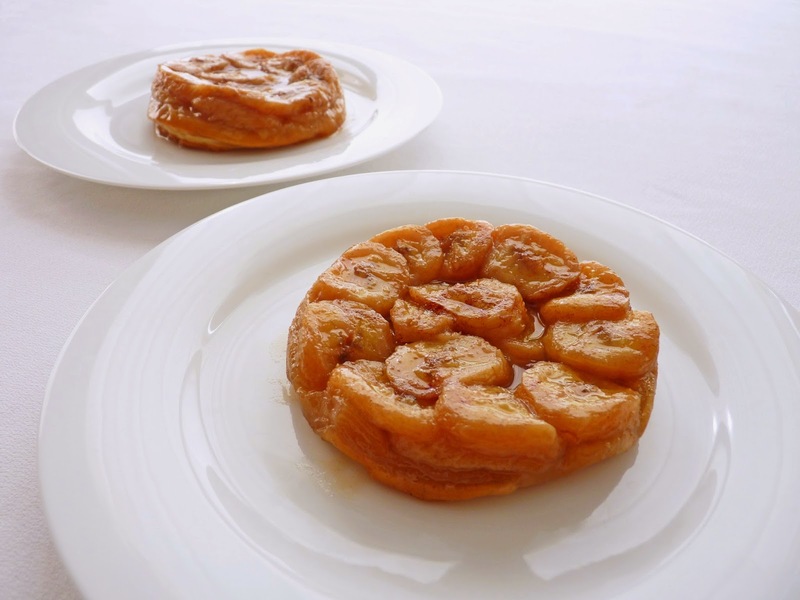 Using a cookie cutter or a sharp knife, cut out shapes from the dough and arrange over fruit. Place the pan on a baking sheet to catch any drips. Bake until the topping is golden brown and the fruit juices are bubbling, about 30-35 minutes. Transfer to a wire rack and cool. Serve warm or at room temperature. Strawberry season is upon us! There is truly nothing like the onset of spring and the first appearance of gorgeous strawberries. Their bright red color and luscious flavor are a most welcome addition to our pastry toolbox. They are the first to appear in our long and lovely parade of fresh fruit this time of year, so each spring I know I have to begin the celebration with strawberries. As usual, I like to keep things simple. Strawberries need no fancy work up. 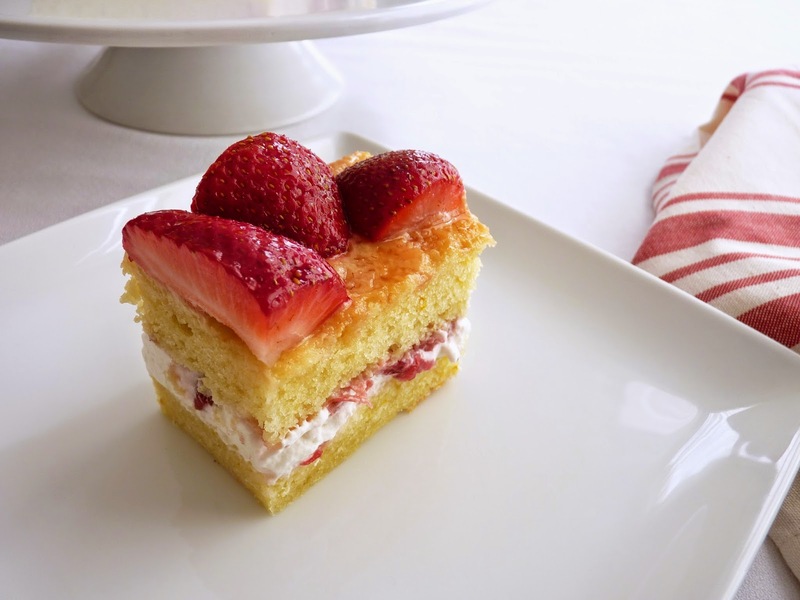 A simple cake and some whipped cream enhance them quite deliciously. This cake is made with yogurt, orange and lemon zest and canola oil. I also add a dash of olive oil, just enough for a bit more flavor but not too much that it overwhelms the delicate flavor of the strawberries. Whipped cream swirled with sugared strawberries fill the center. In the end, what sounds and looks like a plain affair is in truth really quite luxurious. A very good way to kick off our slide into spring. Here’s to the beginnings of a wonderful spring season full of fresh berries, cherries, apricots, peaches, nectarines, plums and figs! - You can use full fat or low fat yogurt. - Add a bit of orange zest or a dash of balsamic to the mashed berries for variation. - Use a long serrated knife to cut the cake in half and to trim the sides. 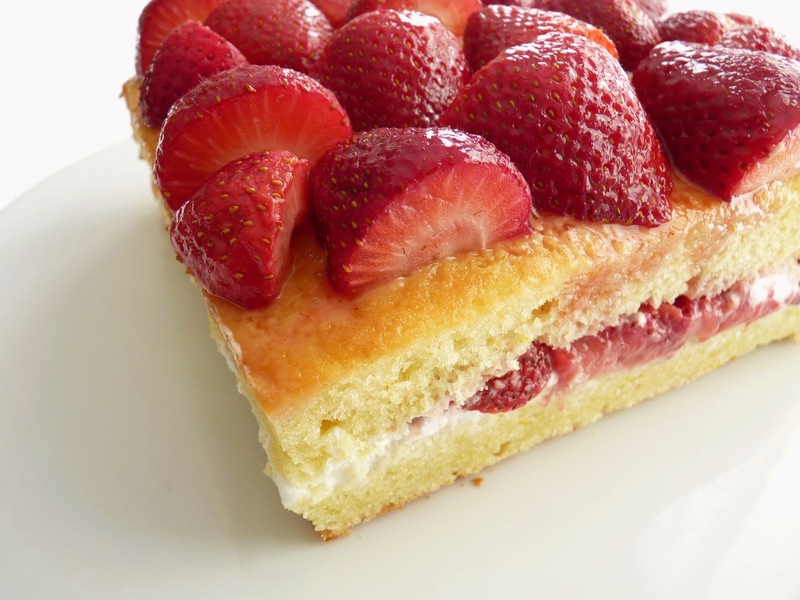 - This is a very versatile cake you can serve with any fresh fruit of the season. I baked it in an 8" square so it would be tall enough to layer but it can also be baked in a 9" round with fruit served along side your slices. Check it after about 28 minutes. - Of course, Strawberry Shortcake is also a MUST. There’s Almond Shortcakes and Sour Cream Shortcakes with Berries. Preheat oven to 350 degrees F. Grease an 8” square cake pan and line the bottom with parchment paper, leaving an overhang of an inch or so on two sides. Sift the flour, baking powder, baking soda and salt. Set aside. Whisk together the canola and olive oil, sugar, eggs, lemon and orange zest and vanilla until thoroughly combined. Mix in the yogurt. Add the flour mixture and whisk to fully incorporate. Pour the batter into the prepared pan. Tap the bottom of the pan on a work surface a few times to eliminate any air bubbles. Bake until the cake springs back when lightly touched and a tester comes out clean, about 32 - 34 minutes. Cool the cake in the pan on a wire rack for 10 minutes, then run a thin bladed knife around the edges to loosen it. Carefully lift the cake out of the pan using the parchment overhang to assist. Remove the parchment and cool completely. 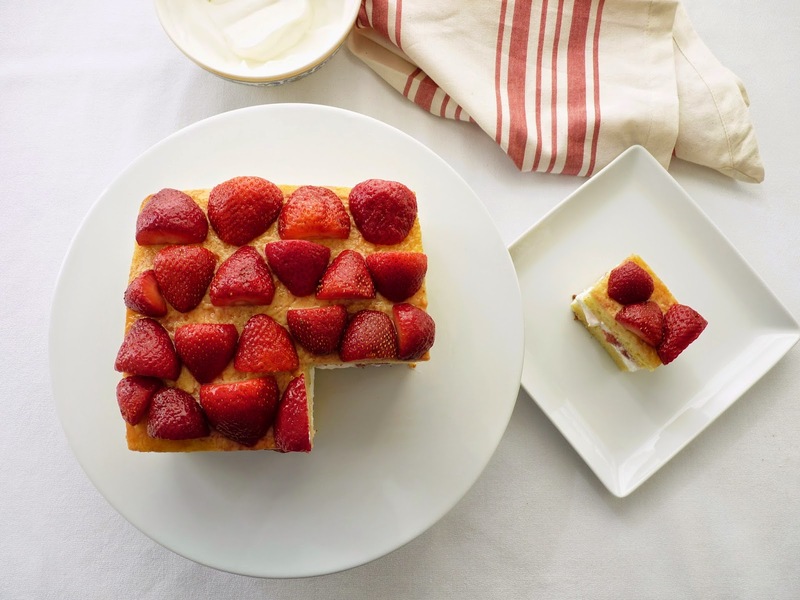 Set enough strawberries aside to decorate the top of the cake. Hull and slice the remainder into a bowl. Add sugar, to taste, and toss thoroughly. Set aside for about 10 - 15 minutes to macerate. Whip the heavy cream, sugar and vanilla to medium peak. Drain the strawberries and reserve the juices. Fold about half of the berries into the cream. Slice the cake in half horizontally and set the top half aside. Spread the cream on top, leaving about a 1/2” border on all sides. Top with remaining sliced berries. Place the other half of the cake on top and press down gently to secure. Decorate the cake with reserved berries. 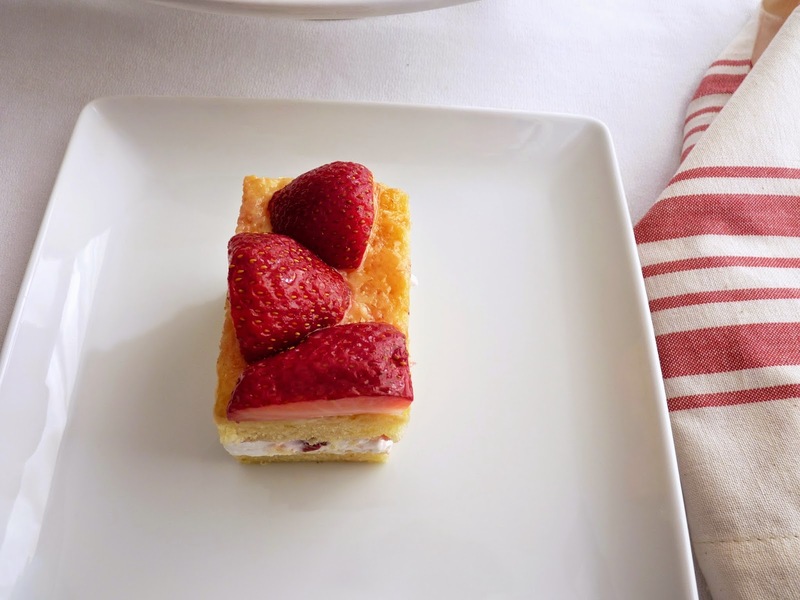 Brush the top of the cake and berries with reserved juices. Trim the sides if you'd like a neater presentation. Chill until ready to serve, then bring to room temperature. Among the most iconic French pastries is perhaps pâte à choux. It forms the basis for the cream puff and the éclair sold by the dozens in just about every pastry case around the world. This crisp and light-as-air pastry shell, made by cooking water, flour and butter, then adding eggs until it becomes a silky paste, is a great vehicle for an array of delicious fillings and toppings, sweet and savory. 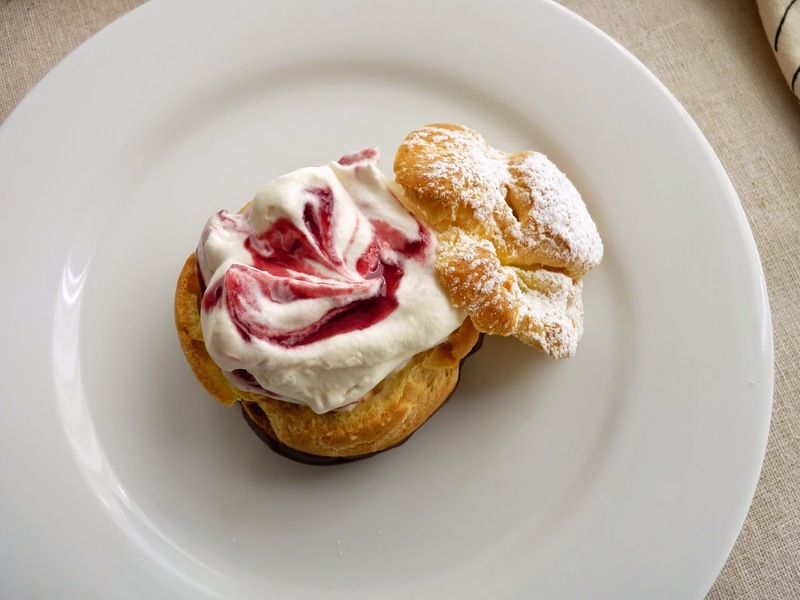 Whether it’s pastry cream and chocolate glaze for the éclair, a billow of whipped cream for a cream puff, a scoop of your favorite ice cream for profiteroles, or a cheesey gougère, there’s no hope of resisting the temptation of each and every bite. And they make excellent small indulgences that really satisfy a craving for a simple pleasure without being so heavy that you wish you hadn’t. There are thankfully no regrets with pâte à choux. The cream puff is a super simple pastry filled with sweetened whipped cream flavored with vanilla (aka, crème chantilly) and dusted with powdered sugar. 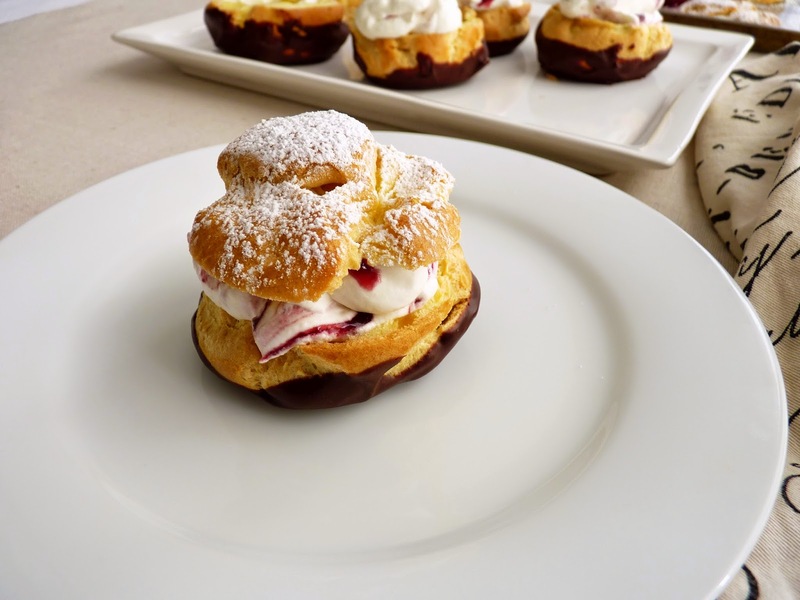 In this Raspberry Chocolate Cream Puff, I’ve taken this simple concept and dressed it up a bit by making puffs filled with whipped cream that's been swirled with raspberry jam. The bottoms are dipped in chocolate, tops dusted with powdered sugar. The pastry is still light, crisp and airy and presents a bright and alluring visual element. It’s an easy dessert that takes just a few minutes to assemble. And truly, there’s nothing like a cream puff. Place your piped pâte à choux in the oven and then wait for the magic to happen. You’ll be amazed at how gorgeous they look after just 22 minutes or so. Breathtaking! 1) Once you add the flour to the boiling water and butter, stir constantly and cook the dough for a couple of minutes until there’s steam rising and a distinct film appears on the bottom of the pan. This is important because you need to cook out the taste of the flour. 2) Take the dough off the heat and beat it in a mixer with a paddle on medium speed or with a wooden spoon until there is no longer any trace of steam rising. This helps to dry out the dough in preparation for incorporating the eggs. 3) Add the eggs one at a time and mix thoroughly before adding the next. The dough will look lumpy at first but will smooth out beautifully. Scrape down the bowl after each addition. 4) The pâte à choux is ready when it's smooth and shiny and falls from a rubber spatula in gloppy sheets. 5) Always use an egg wash to ensure beautiful even browning. 6) The test for baked pâte à choux is when the pastry feels very light and sounds hollow when tapped. 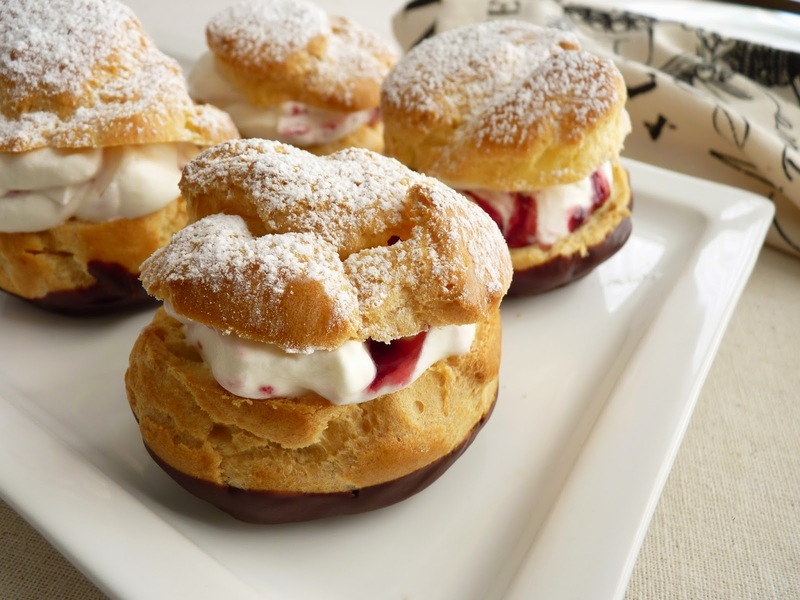 - I use a serrated knife to slice the cream puffs. - Pâte à choux are best eaten the same day but you can also freeze them baked and unfilled in an airtight container. Thaw and crisp in a 350 degree F oven for about 8 – 10 minutes. 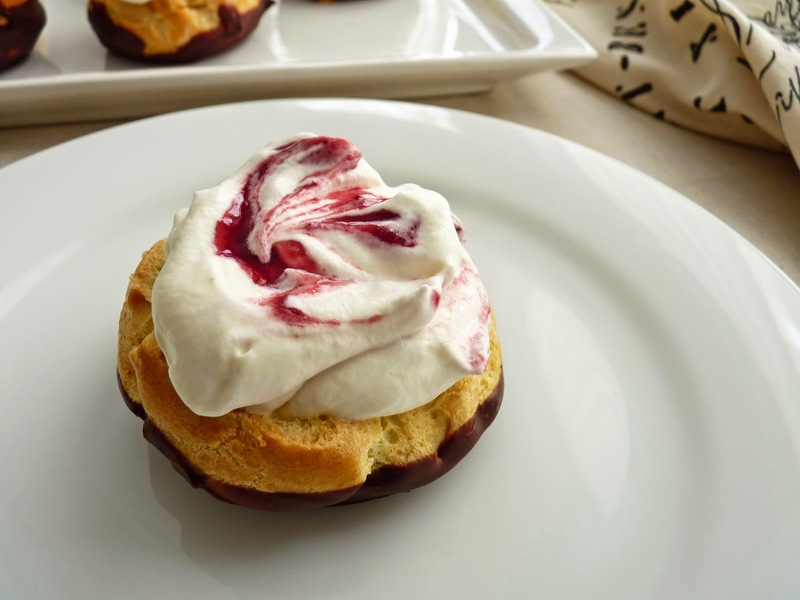 - Swirl your favorite jam into the whipped cream or layer with fresh fruit. - Switch up the vanilla in the whipped cream with almond extract or brandy. - A wonderful holiday treat: Profiteroles with Egg Nog Ice Cream and Rum Sauce. Preheat oven to 425 degrees F. Prepare 2 baking sheets with silpats or parchment paper. Bring the water, butter pieces and salt to a rolling boil. Reduce heat and add flour all at once. Cook and stir the mixture with a wooden spoon until it’s smooth, pulls away from the sides of pan and leaves a noticeable film on the bottom of the pan. This will take a couple of minutes. Pour the mixture into the bowl of a stand mixer and beat with the paddle attachment (or use a bowl and a wooden spoon) until there is no longer any steam rising from the dough. Beat in one egg until thoroughly mixed. The dough will go from looking lumpy to very smooth. Scrape down the bowl, add the second egg and beat until you have the same results. Continue with the remaining 2 eggs. While the dough is mixing, make an egg wash by combining the egg, water and a slight pinch of salt. Set aside. Place the pâte à choux into a pastry bag fitted with 1/2" plain tip. Pipe mounds approximately 1 1/2" in diameter. Wet your index finger with cold water and smooth the tops of each piece of piped dough. Brush lightly with egg wash (you’ll have a lot left over). Bake until golden brown and puffed, about 22 - 24 minutes. Remove from the oven and cool completely. Finely chop the chocolate and place in a heatproof bowl with the butter over a bain marie with an inch or so of barely simmering water, making sure the bottom of the bowl isn’t touching the water. As it melts, stir to thoroughly combine. Remove from heat and cool for a minute or so. Take each pastry puff and dip the bottoms into the chocolate, scraping against the bowl to remove excess. Place them with the bottoms up on a baking sheet. Chill until set. Whip the heavy cream with the sugar and vanilla to soft peak. Dollop with the jam and use a small spatula or knife to swirl. Using a serrated knife, cut the tops off the pâte à choux and place on a baking sheet. Dust with powder sugar. Place a dollop of whipped cream in the bottom and replace the tops. Serve immediately.